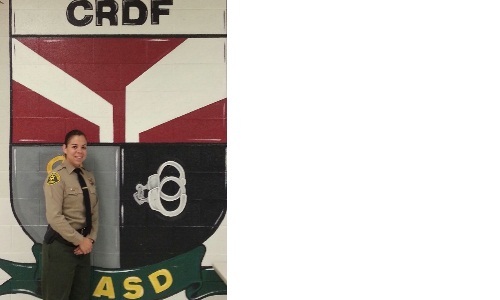 Inmates were eating their dinner Thursday evening, September 12, at Century Regional Detention Facility (CRDF) when Deputy Kristen Aufdemberg noticed an inmate who appeared to be choking on her food and having difficulty breathing. Deputy Aufdemberg immediately ran towards the inmate and saw the inmate's face turning bluish-gray as she struggled to breathe and couldn't talk. The deputy began administering life-saving treatment to the choking inmate. She stood behind the inmate, wrapped her arms around the inmate's waist, and made several quick inward and upward thrusts into the inmate's stomach area (Heimlich maneuver). "She was in a wheelchair, so I asked her if she could stand up but she shook her head no," said Deputy Aufdemberg. "I crouched behind her, reached under her arms and positioned my arms around her. I lifted her up, leaned her back, and after five firm thrusts, the piece of meat projected out of her mouth and she began to breathe again," she said. Afterwards, she started crying and kept saying thank you." The other inmates burst into applause. Los Angeles County Jail medical professionals responded immediately to the housing module and provided additional medical treatment. The inmate was medically cleared and is in good condition. 63 inmates who witnessed the life-saving actions of Deputy Aufdemberg signed a note written by one of the inmates, thanking her for saving the life of their cellmate. They also used a form usually used by inmates for complaints to write her a commendation. "The Deputy that save a life September 12, 2013. Time 5:10am. We the inmate of witness Deputysave...Mslife by doing the some type of something but it stop her from chocking and not breathing, which was the Heimlik Maneuver. " "We the inmates in 2600, witnessed a miraculous event that took place today as we were having dinner. One of the inmatesbegin to choke until she couldn't breathe. Deputy Aufelenberg immediately performed the heimlik procedure which brought back breath intocausing her to breathe again. It was such a miraculous event that all the inmates were in shock. We also want to state that when the medical staff arrived, was breathing and eating, in result of Deputy Aufelenburg's non-hesitancy. We the inmates of 2600, feel that Deputy Aufelenberg should receive MAJOR RECOGNITION IN HONOR OF HER HEROIC GESTURE of savinglife. We noticed today is September 12, one day after 9/11 the day that our nation lost many heroes, but thanks to our hero, Deputy Aufelenberg, a dear life ofwas spared, which makes this, an event, so memorable." The Century Regional Detention Facility of the Los Angeles County Jail System houses women jail inmates. 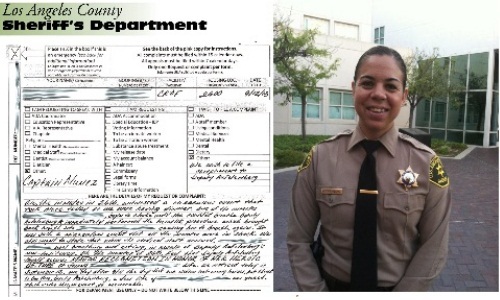 Deputy Aufdemberg is a one-year veteran of the Los Angeles County Sheriff's Department. She was trained and certified in the Heimlich maneuver during First Aid and CPR classes at the Los Angeles County Sheriff's Academy.